The Assumption Parish Clerk of Court handles birth and death certificates, marriage licenses, and other vital records. It is located at is 4809 Hwy 1, Napoleonville, LA, and they can also be reached at (985) 369-6653 or (985) 369-2478. Assumption Parish also makes use of an online indexing system which has various subscription options, from 24 hour access to a full year. Marriage records are available from 1943 to present day, conveyances from 1944 to present, and others have assorted lengths they are available from. The online indexing system also charges $1 per page to print records. 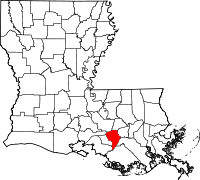 Assumption Parish is one of the original Parishes in the Louisiana Territory and was founded in 1807. It has long been a farming community, being located towards the base of the Mississippi River and benefitting from the rich and fertile earth it brings.